Home Shopping Beth Ditto has a new Fashion Line! New plus size fashion has been given unto us… and it is good! 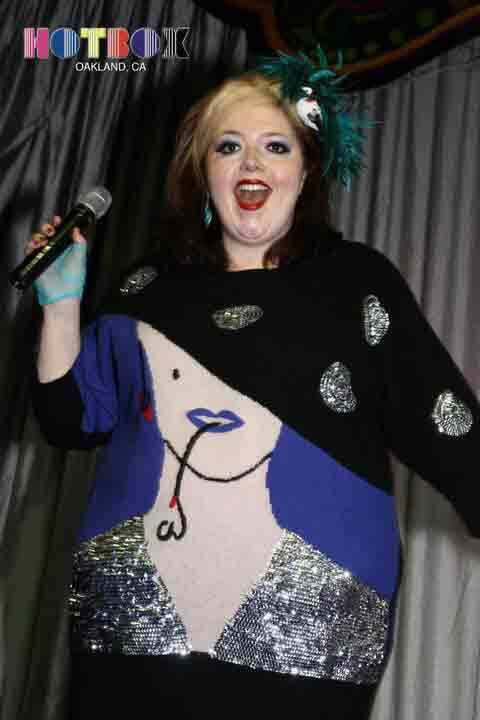 One of my very favorite wardrobe staples is the sweater face dress I bought from Beth Ditto’s first fashion line, a collaboration with Evans in the UK. For those of you who don’t know Beth Ditto, she’s probably the most famous queer fat femme out there, rising to fame as the lead singer of Gossip, has her own awesome solo music projects and wrote a memoir with Michelle Tea. I consider that sweater dress an investment piece–I spent a bunch of money on it, I adore it and will continue to wear year after year. I always make a huge impression when I wear it. Beth’s first line for Evans was so killer and I still regret not buying the Domino dress! At the time I was working for Re/Dress in Brooklyn and Deb, the owner, coordinated a big purchase from Evans so we could all share the shipping. I think each of the shop girls bought a piece! This time Beth is doing it herself as an indie designer–no corporation. Everything is made in factories in NYC and she’s gotten input from her designer friends to help put it together. Beth says herself these are investment pieces, and she’s right. They are priced like indie designer pieces but from what I can tell via the internet look totally worth it. Timeless and well conceived. I can’t wait to hear from folks their feedback about the fit and fabric! When I am a rich lesbian I will buy the Lola dress in Lipstick Traces. I LOVE the cut and the color and fabric pattern design. As my readers know I’m in the middle of my transition from NYC to LA so since I’m living off savings and working on new career prospects I don’t have the cash to plunk down on all of the jumpsuits and dresses I want to add to my life. I thought I would aspirationally shop on this post to perhaps inspire my readers to buy some of her pieces so she can be wildly successful with this venture and continue to make clothes that I can buy when my transition period is over and I am a rich lesbian. I LOVE this Modern Love Jumpsuit in Liquid Black. I just think wearing a sheer silver lamé jumpsuit with great underwear out to an event with exceptional shoes sounds like an amazing experience. New item on my bucket list! The Modern Love Jumpsuit is also in this Times Square pattern. Adore it! While my first choice dress from the collection is the Lola, I’m kind of dying over the Nina dress! I think it’s so versatile, I think it could be a good fancy work dress, a great cocktail party dress, a great red carpet dress. And if I were giving Hillary Clinton a make-over I would put her in this dress. The only reason it’s not my top choice for aspirational shopping is because I have a dress that is a similar cut and color combination. The Double Bubble Dress in Eat Your Make-up (comes in a couple of other colors as well) is on top of my list to twin with Kelli Jean Drinkwater, my queer fat femme friend from Sydney Australia. Because when I’m a rich lesbian I’ll fly her to LA so we can twin in whatever we want! Both the Leigh Dress and the Kim oversize shirt look sooo comfortable. I have a dress that is sleeveless with a similar drape, big and flowy, and it is perfect in hot weather. Casually glamorous. Working at Re/Dress for the three years it was open in Brooklyn and being a body positive activist for over fourteen years has put me in contact with so many indie plus designers. Doing this work is truly a labor of love, has a lot of overhead and rarely yields a profit that lets anyone live high on the hog. I love to support indie designers and think that it’s worth it to spend your money on a quality garment that’s well made. As plus size consumers we have way more corporate options than ever before and sometimes you need/want a pair of $13 jeggings from Forever 21. But I think that prioritizing our investment piece spending to indie designers who support the mission that all bodies are worthy of great fashion and style is super important! Readers! If you get one of Beth’s pieces tell me how the fit is and what you loved about it in the comments, on my Facebook fan page or on instagram!